There are endless options when it comes to the running shirt. 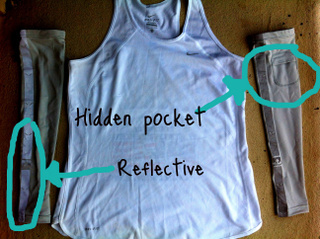 Whereas most other running gear is admittedly lacking in style, here you can let your inner fashionista shine through! For comfort and maximum versatility, I recommend tank style (either loose or fitted). Tanks are more airy than sleeved styles and seem to chafe me less. In running lingo, a tank top is also known as a running singlet. Fitted tanks often have built in support (helpful for the bustier gals) and pockets. Looser tanks tend to be more lightweight. They are especially comfortable for warm weather running and for those who may have been hitting the pizza a bit too hard! For guys, I find the higher neck tanks to be more stylish, but any neckline works. If you are a bigger guy, tanks do tend to run small (think sausage in a casing). If you’re uncomfortable with that, consider a short sleeved style, which have larger sizes available. The most important consideration for your running shirt is the fabric, as it will help minimize chafing. The material must transfer/wick away sweat from your body. It should feel soft and have minimal raised areas (seams, tags, etc.). Shirts specifically designed for distance running tend to be the best bet for finding all of these features. Think about where and when you’ll be training and racing. If it’s warm, light colored (whites and pastels) running shirts will keep you cooler as they absorb less sunlight (versus black-ish colors). Bright colors (orange, green, yellow) are easier to spot during a crowded race. They also won’t stain as much when that energy drink sloshes on you or your bib safety pins rust! Reflective and neon solids also help you to be more visible to drivers if you are running in the dark. If you’re going to run in cold weather (for me, below 60 degrees, but you may have a different temperature threshold), add coverage to your running shirt. If the temperature is sub-freezing, consider a running jacket, hat and gloves. Otherwise, add individual arm warmers (running sleeves). Sleeves typically cover between your wrist and arm pit, staying put with rubberized edges. 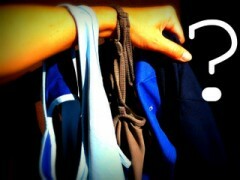 They are much easier to remove and store while running versus a long-sleeved shirt. 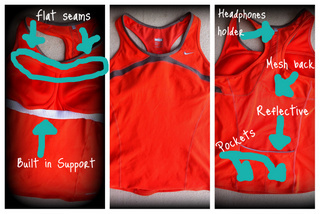 You can rinse and re-wear sleeves with several different running shirts. Added bonus: sleeves often have cool features like reflective stripes, extra storage and finger gloves. Want more information? Click on any image or item name (throughout this series of posts) to see more details and cost. Stay tuned for the second post of this series, where I’ll discuss two items critical to preventing chafing. Sign up for your FREE weekly newsletter with exclusive training tips starting today!